Hello. My name is ___________. And I have Ruby Slipper Syndrome. Over the course of the last several years, my sister Toni and I have discovered some very alarming symptoms within our lives. These symptoms initially started as quick, manageable agitations that briefly interrupted a few moments of our lives. They were nothing to fear for they floated away as quickly as they appeared. But slowly and surely they began to make their way into our daily routines. They would creep up over lunchtime conversation. They would slip out under our breath. They would stall us in our tracks. Until eventually, they were all we could think, speak, and feel. They slowly overwhelmed us and took our joy. They would even capture our bodies to where we had no energy, were eating everything in sight, sluggishly moping around our homes and workplaces. Now it’s quite possible that these symptoms weren’t obvious to the ever-present world around us, but for us, they were always there biting at our heels and making us crazy. After long talks and some prayer, we realized these symptoms had a name… We were suffering from Ruby Slipper Syndrome. Yes, this is completely fictitious and yes, we made it up. But before you write it off let me explain this syndrome a little more. Consideration of Abandoning All Loved Ones. The list could go on, but I think you get the drift. Now, let’s talk about the naming of this “syndrome”. 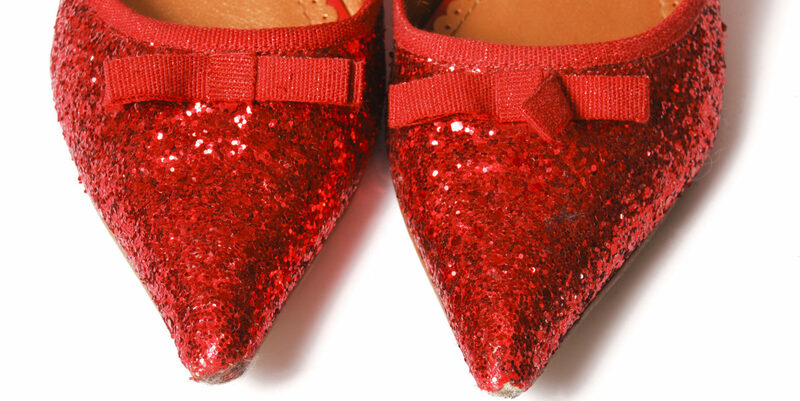 RUBY SLIPPER SYNDROME comes from the classic tale of Dorothy’s trip to Oz (the film version of course). As we all remember, Dorothy came from a nice quiet, peaceful existence in Kansas (somewhat like my sister and I). In this existence, Dorothy had plenty of people around her that loved her, a nice roof over her head, a job, and an adoring puppy dog (who could ask for more) although, admittedly, her life was probably a bit boring. Not only was her life dull, but she had experienced a few challenges right before venturing off into the great land of OZ. And we all know that sometimes a slew of challenges coupled with boredom can swing us into such places. I digress. Once she arrived in OZ, the beginning of her problems started with those darn slippers. Those slippers were a bad idea from day one, I mean the previous owner had a house fall on her while wearing them. A house! That should have said it all. And once Dorothy got her dainty feet in them, her luck shifted as well. A witch was out to get her, flying monkies squawked around her at every turn, trees came to life and tried to killer, her but let’s be real, I’m sure she LOVED those slippers. They looked great on her feet! And now that she could see in color, who wouldn’t want a pair of bright ruby red pumps? Everyone wanted them. And she had them. Not bad for a humble girl from black and white, pancake-flat Kansas. These ruby slippers lead her down a long, windy, dangerous interstate called the Yellow Brick Road where she met some friends, yes, but mostly where she encountered some overwhelming peril. The booger of it all is that she didn’t have to go down that Yellow Brick Road at all to get home. The entire time she was gallivanting around Oz trying to find her way back, all she needed to do was scuff those stupid shoes up with a little click and she would have been right back where she needed to be… home. She could have avoided dodging monkeys, rescuing friends, and killing wicked witches. A simple acknowledgment of the truth (“there’s no place like home”) and a willingness to get those shoes beat up would have done the trick. In Dorothy’s defense, she didn’t know this. The deceptive, old Wizzard had to tell her. Then again, maybe she did, but she wasn’t quite ready to leave all that “color”. It’s also quite possible that maybe the journey is what helped her figure out that truth. But the facts are still the facts… she could have gone home any minute and avoided all that drama. It dawned on us. We were no different than Dorothy. Sometimes the ruby gleam of things we never had and were never meant to have, keep us moving down yellow brick roads of destruction in a land full of treachery and confusion. Now that we have mapped out our self-diagnosis and the work of fiction that gave us our light-bulb moment, allow us to state our treatment plan. We’re still figuring that out. What we do know, is that we have a problem that needs fixing. We know that we’ve spent too much time wandering down the yellow brick road of our ridiculous thought patterns, which inevitably made us contract these yucky symptoms. We also know that we’re ready to click these glittzy devil-shoes to bits if it means we can get home again. So with this blog begins our journey. If you feel as if you have also contracted Ruby Slipper Syndrome, please join us on our road to recovery. I, too am on a journey toward contentment as well. This describes so well something so many people walk around masking. I’m excited to follow your journey through this all. Thank you for your transparency! Meg on Hello. My name is ___________. And I have Ruby Slipper Syndrome.